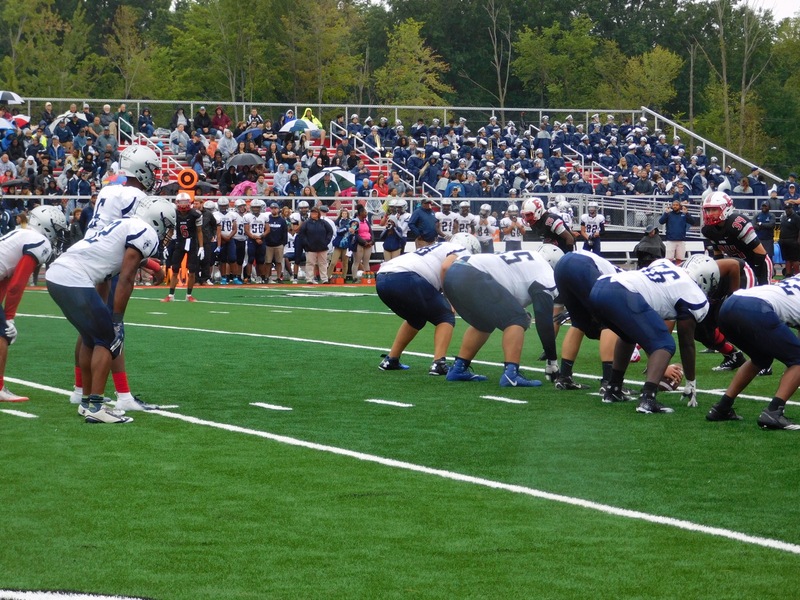 ELYRIA, OHIO – Led by a stifling defense and a hurry up offense that kept up the pace all afternoon, the Lorain Titans pounded the Elyria Pioneers 40-7 at the new Ely Stadium in Elyria. The Titans push their 2018 mark to 2-1 with the win, dropping the Pioneers to 0-3. Playing in a steady rain that got worse as the day progressed, the Titans quick strike offense built a 26-0 halftime lead and never looked back. “We have a young team, playing at 2pm on a Saturday in the rain and it’s wet is not our usual rhythm,” Lorain coach Dave McFarland said after the win. The Titans were winners in week one beating Midview 44-14, and in week two they lost by three touchdowns to Euclid 42-21. Saturday they took out some of that frustration from their loss last week, pounding the now 0-3 Pioneers and holding them to just 26 yards in the first half as they build a big lead. Elyria had just 16 yards rushing and nine yards through the air in the first half, and were held in check all day by the hard hitting of the Titans. Running back Daylin Dower was the workhorse for the Titans, rushing the ball 19 times for 240 yards and two scores including a 67-yard score in the final quarter. Junior quarterback Jordan Jackson ran in two scores to get the Titans off to a 14-0 lead midway through the second quarter. After a late interception by the Titans in the first half, Jackson hit wide out Zach Evans with a 40-yard touchdown to make it a 26-0 Lorain lead. That score with :36 left in the half came after Savon Chavis went in from three yards out to make it 20-0 with :56 seconds left in the second quarter. At half the Titans had outgained Elyria 226 to 25. Dower in the first half had 156 yards rushing on 16 carries. The third quarter started with the Titans getting a 65-yard kickoff return by dynamic Tyshawn Lighty, and it took one play for Chavis to go in from 15 yards out to make it 33-0. The Pioneers finally got on the board with 8:50 to play in the game, as junior back Adaveon Drummer raced in from 16 yards out for the only Elyria score of the day to make it 33-7. The drive for Elyria covered eight plays and 57 yards. Dower wrapped up the scoring with his long 67-yard touchdown with 7:15 left to put the Titans up by the final margin of 40-7. “Our kids played hard last week, it was an emotional game we felt we were outmatched a little bit,” McFarland said of the teams’ week two loss to Euclid. The Titans are in action on Friday night at home as they take on St. Joseph’s out of Ottawa, Ontario. Elyria will be in Solon to take on the Comets. In a game played mostly in a driving rain on Saturday in Elyria, it was the power running of bruising running back Daylin Dower that set the pace for the Titans in their 40-7 win. “He’s a special kid,” Lorain coach Dave McFarland said of Dower, who on the day ran for 240 yards on 19 carries with a pair of touchdowns. He set the pace early with a fourth down conversion off a fake punt in which the ball was directly snapped to him and he scampered for the first down. “Maybe we just need to snap the ball to Daylin all the time,” McFarland joked about the early trick play. Dower put the finishing touches on the win with 7:15 to play as he raced 66 yards with the final score of the day, a play that was his last of the day in the big win for Lorain. Here’s a photo gallery from Saturday’s Week three action between the Titans and Pioneers.